Hayes Heating & Cooling is a family-owned and operated full-service HVAC company specializing in residential installation, service and maintenance of heating and cooling equipment in the St. Louis region. 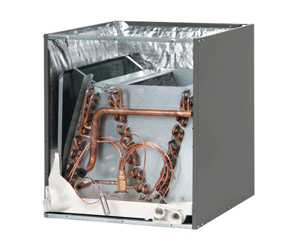 We install and service forced-air furnaces, air handlers, boilers and water heaters. We provide prompt, professional service and complete maintenance plans to keep your systems operating efficiently. Since 1985 we have proudly served St. Louis and the surrounding metropolitan area. From Jefferson County, St. Louis County, St. Louis City and everywhere in-between our service vehicles can typically be to your home in under an hour. Hayes Heating & Cooling primarily offers and installs the Ruud product line – however, we install, service and maintain many other brands. Schedule an appointment with us today or contact us to ask any questions. We can be reached at 636-938-9551 and hope to earn your valued business. Hayes Heating & Cooling provides sales, service and installation for all types of heating and cooling systems. We treat our customers with respect and focus on building a lasting relationship. Our service record speaks for itself and call-backs are minimized. We are proud to offer Ruud equipment. They offer unmatched warranties in the industry on their long-lasting products. Gas-fired furnaces range in their energy efficiency and they are ranked based on their respective Annual Fuel Utilization Efficiency (AFUE). AFUE is the standard measurement of efficiency for gas and oil-fired furnaces. Measured in percentages, this number tells you how much of your fuel is used to heat your home and how much fuel is wasted. The higher the AFUE rating, the greater the efficiency. Hayes Heating & Cooling actively promotes higher AFUE furnaces to help reduce our customers’ monthly operating costs and conserve fossil fuels. We do not actively promote ourselves as a “Green” company, however, our actions prove that we are time and time again. We prefer to install hi-efficiency equipment because it provides increased comfort, decreased monthly costs and exceptional reliability. The minimum rating for a gas furnace today is 80% which is ahead of furnaces installed just 20 years ago that were usually 65%-70% efficient. We offer furnaces that convert $0.95 of every $1.00 you spend on gas energy into heat for your home. Call Us Today to Learn About Ruud’s Superior Product Warranties! The entire line-up of Ruud gas furnaces offers some of the best warranty programs in the heating and cooling industry. You need air conditioning in St. Louis! More importantly, you need an air conditioning system that is in optimum working condition, dehumidifying the air and operating as efficiently as possible. A poorly configured or neglected system will cost you a lot of money! We repair and service all major brands of air conditioning systems and proudly offer Ruud equipment. Ruud use chlorine-free and “green” R-410A refrigerant. All of these units feature the most comprehensive warranty coverage of any air conditioner or heat pump on the market. Hayes Heating & Cooling installs and services air conditioners, air handlers, mini-splits and geothermal systems. If your system is no longer providing cooling then you definitely need a checkup! 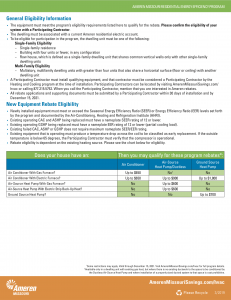 A new Ameren Missouri Rebate program begins March 1, 2019. 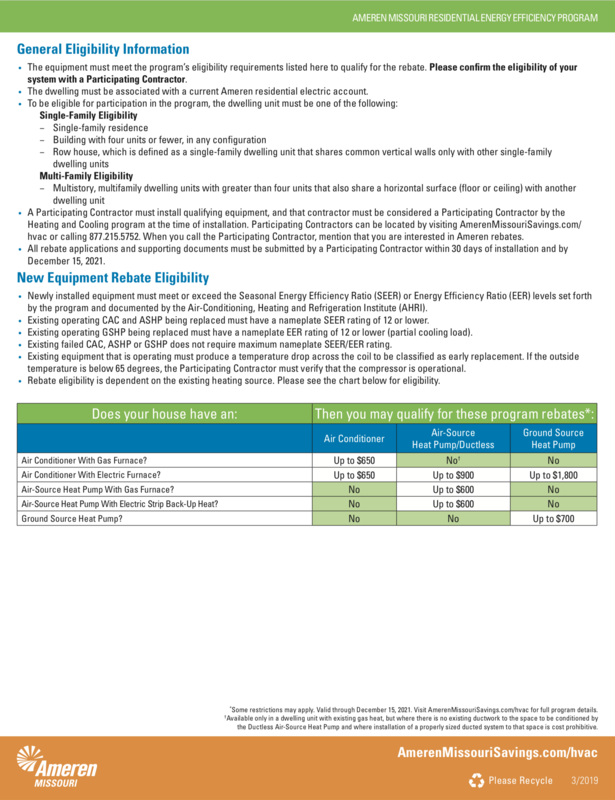 Ameren Missouri is offering their customers a rebate when upgrading their heating and cooling system to a more energy efficient system! You must be an Ameren Missouri Residential Electric Customer. Rebate check will go to the name on Ameren Missouri account. You can reassign the rebate to someone of your choosing as well. Some restrictions may apply. Valid through December 15, 2021. 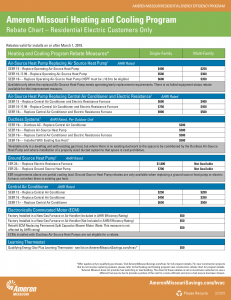 Visit Ameren Missouri For Full Program details for full program details. After installation, we will submit all rebate paperwork on your behalf. Rebates will be processed by Ameren Missouri and they will mail your check within six to eight weeks! We offer financing through FTL Finance. They are a local St. Louis company that is very easy to work with and have helped many of our customers purchase new equipment. The online application process takes a few minutes and they can provide an approval in about 10 minutes. Be sure to ask us about financing options! We have a link to their online application form. We tell our customers they should use a standard 1″ pleated air filter and to change it every 30 days. Expensive and dense 1″ media filters that claim you can change them every 90 days will typically clog before that time and your system will perform poorly. Buy several at once to keep handy so you never run out! Large media filters (4-5″) can usually go upwards of six months before requiring a change. However, factors such as the amount of people, pets and air leakage can greatly alter your requirements. How often should I add freon to my AC? When and how often should I have my furnace or air conditioner checked? Furnaces and air conditioners should be checked on an annual basis for safety reasons such as carbon monoxide poisoning and electrical shock. Most warranties require that an annual inspection be performed (clean & check) on the equipment to keep the warranty valid. Equipment that is routinely serviced will last much longer and problems that may be discovered during the course of a clean & check can be addressed before they become costly repairs. What is an “80% furnace”? 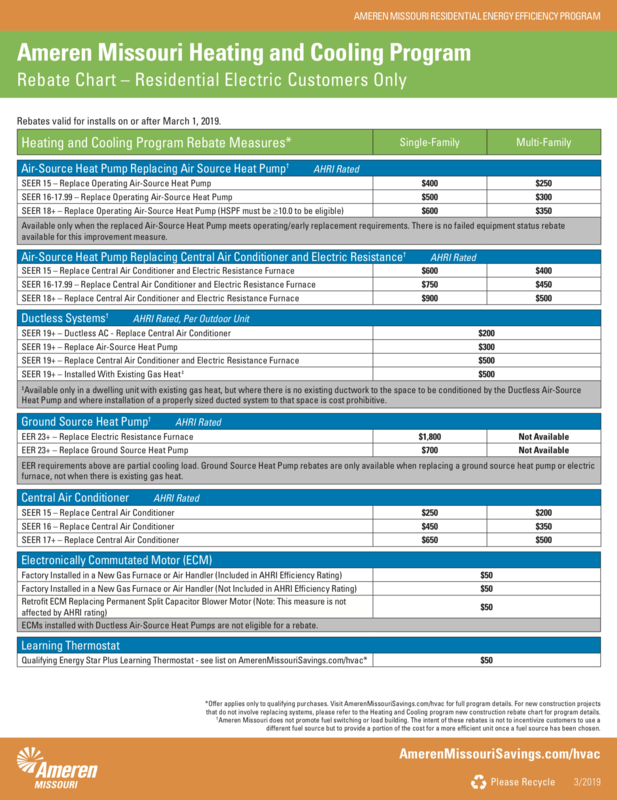 Furnace ratings measure the amount of gas being wasted. That means basically 80% is being used and 20% is going out the flue (heat loss), thus 90% furnaces are sending 10% out of the flue. However 80% is the lowest rating that can be purchased today. Most older furnaces are currently operating at 60% to 70%. We almost always recommend a high-efficiency furnace unless installation of the flue pipes proves to be unfeasible. What is an Condenser (AC) SEER rating? SEER stands for Seasonal Energy Efficiency Ratio. The SEER rating is calculated by dividing the cooling capacity of a continuously operating air conditioner by the electrical input. The higher the SEER rating, the less your equipment will cost to operate year after year. Yes, call us at 636-938-9551 and we would be happy to answer all of your questions. Ask us anything about furnaces, air conditioners, home comfort, poor airflow, indoor air quality, humidifiers, installation, ductwork, room additions, boilers, water heaters, flue liners and more.